Femoral neurostenalgia is a compressive neuropathy which is an uncommon cause of hip pain in active young adults. Compression of the nerve can cause debilitating pain and an inability to walk. Correct clinical diagnosis and correct treatment can result in complete relief of symptoms. We present a case of a young female with a spontaneous acute onset of severe hip pain for ten months. After seeing several specialists and having undergone numerous special investigations, femoral nerve compression by the iliopsoas was demonstrated on ultrasound, but only confirmed during surgery for a suspected femoral hernia. After decompression of the nerve the patient was completely pain free. In the hip the most frequently described peripheral nerve entrapments include the sciatic nerve by the piriformis and the lateral cutaneous nerve by the inguinal ligament near its attachment to the anterior superior spina iliaca known as meralgia paraesthetica.3 Entrapment of the femoral nerve is uncommon and usually low down on the differential diagnoses list, particularly in active young adults, where it is more frequently caused by athletic injuries, trauma, hip pathology and referred pain. A missed diagnosis may lead to prolonged discomfort, debilitating pain and a delay to an athlete's return to sport. An accurate history and clinical examination is important in diagnosing femoral nerve entrapment and ruling out other causes.2 According to the literature search, ultrasound diagnosis of femoral nerve neurostenalgia by the iliopsoas has not been described before. An active 24-year-old female nursing student who jogs every day presented in April 2010 with an acute spontaneous pain in her left groin and leg after a two-hour flight. The leg felt heavy/'dead' and appeared swollen. The pain was so severe that she had great difficulty in walking. A venous duplex Doppler of the leg revealed no thrombus; the veins were reported as patent with normal compressibility and flow. Blood investigations including thrombotic work-up were normal. X-rays of the lumbar spine and femur, MRI of the femur and a bone scan did not show any abnormalities. The debilitating symptoms persisted; in June 2010 a neurosurgeon referred her for a MRI of the pelvis and spine, which was reported as normal. In October 2010 she consulted a neurologist, and although the EMG results were normal he indicated that her clinical presentation was suggestive of a femoral neuropathy and referred her for an ultrasound examination. 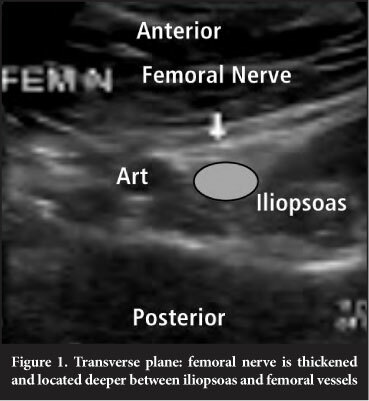 In December 2010 the ultrasound examination revealed femoral nerve neurostenalgia by the iliopsoas muscle. The nerve was thickened with a round appearance and located deep between the iliopsoas and the femoral vessels (Figure 1). 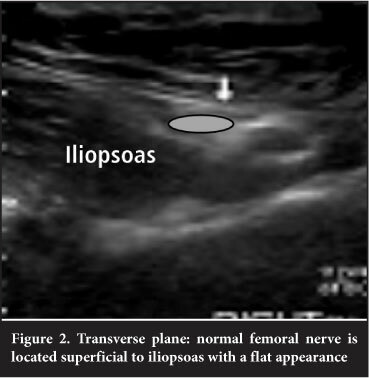 Normally the femoral nerve is located superficial to the iliopsoas muscle with a flatter appearance (Figure 2). No atrophy of the quadriceps muscles was seen at this stage; the appearance and thickness was similar to the opposite side. In January 2011 the neurologist referred her to an orthopaedic surgeon who referred her to a general surgeon who suspected a femoral hernia and had her booked for a hernia repair. No hernia was found, but it was discovered that the femoral nerve was entwined and impinged by iliopsoas. A 15 cm release was done and the nerve repositioned superficial to the iliopsoas. With her discharge she did not have the tremendous pain she had experienced for almost ten months. Her recovery was rapid and with the removal of the stitches she was completely pain free with only a slight loss of sensation in the right leg. The patient saw five specialists (orthopaedic surgeons, a neurosurgeon, a neurologist and a general surgeon) and had several special investigations including MRIs, a bone scan and EMG without resulting in a diagnosis. It was only after surgery for a suspected femoral hernia that the diagnosis of femoral nerve neurostenalgia as demonstrated on ultrasound was confirmed. After decompression of the nerve she was completely pain free and able to finish her nursing degree a year later. This case serves as a reminder of the importance of a complete history and clinical examination.